Hans Kammler, sebuah nama yang memang hanya segelintir orang saja yang tahu termasuk saya :D mengenai sosok jendral yang satu ini. nama Hans Kammler sudah sering menjadi pembicaraan banyak orang (politikus, militer, wartawan, dll) sejak kiprahnya di perang dunia ke dua (World war II). Saya rasa cukup intro dari saya, sekarang langsung masuk ke dalam pembahasan siapa sebenarnya Hans Kammler. General Dr Hans Friedrich Karl Franz Kammler (August 26, 1901 – April 1945?) was an engineer and high-ranking officer of the SS. He oversaw SS construction projects, and towards the end of World War II was put in charge of the V-2 missile programme. Stettin, Germany. In 1919, after volunteering for army service, he served in the Rossbach Freikorps . From 1919 to 1923 he studied civil engineering in Munich and Danzig. He joined the NSDAP in 1932 and held a variety of administrative positions when the Nazi government came to power, initially in the Reichsluftfahrtministerium (RLM - Aviation Ministry). In 1940 he joined the SS, where from 1942 he worked at designing facilities for the extermination camps, including gas chambers and crematoria. Kammler eventually became Oswald Pohl's Deputy in the WVHA (Reich Administrative and Economic Main Office), which oversaw Amtsgruppe D (Amt D), the Administration of the concentration camp system, and was also Chief of Amt C, which designed and constructed all of the concentration and extermination camps. Following the Warsaw Ghetto Uprising in 1943, Heinrich Himmler assigned him to overseeing the demolition of the ghetto in retaliation. Kammler was also charged with constructing facilities for various secret weapons projects, including manufacturing plants and test stands for the Messerschmitt Me 262 and V-2. Following the Allied bombing raids on Peenemünde in "Operation Hydra" on August 17, 1943, Kammler was assigned to moving these production facilities underground, which resulted in the Mittelwerk facility and its attendant concentration camp complex, Mittelbau-Dora, which housed slave labour for constructing the factory and working on the production lines. He was also assigned to the construction of facilities at Jonastal and Riesengebirge for nuclear weapons research and at Ebensee to develop a V-2 derived ICBM. In 1944, Himmler convinced Hitler to put the V-2 project directly under SS control, and on August 6 replaced Walter Dornberger with Kammler as its director. 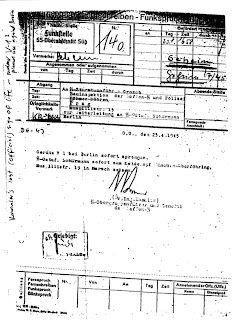 From January 1945, he was placed as head of all missile projects and just a month later was given charge of all German aerospace programs as these came under SS authority as well. 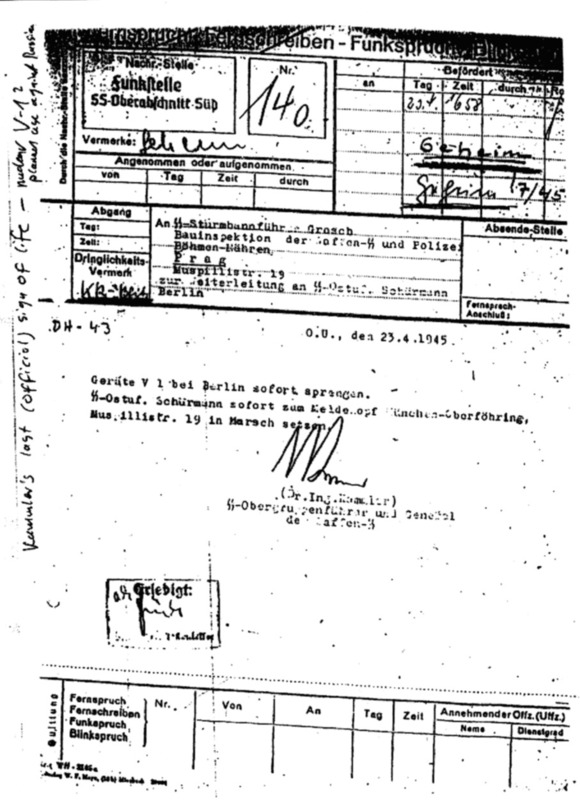 In April 1945, Kammler disappeared. Some reports suggest that he was assassinated by a member of his staff, acting on orders from Himmler not to allow personnel with detailed knowledge of the rocket programme to fall into Allied hands. Others indicate that he may have been killed in action or committed suicide somewhere around Prague. The fact that his exact fate is unknown and that his body was never recovered led to some speculation that he continued his work in the United States after the war, where it is alleged he worked on anti-gravity and other advanced devices. Agostan's book details all FOUR of the supposed death scenarios of Hans Kammler. These may well have been simply misdirection. A recent (2001) book by Nick Cook, The Hunt for Zero Point investigates the possibility that Kammler was brought to the United States along with many other German scientists as part of the program known as "Operation Paperclip" (Christopher Simpson, Blowback). There are no known facts that support this theory. 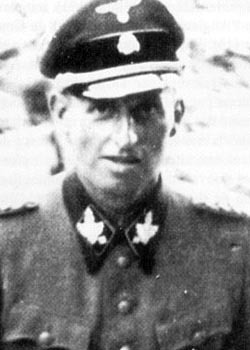 There have been no "Kammler sightings" since the end of the war, contrary to the cases of other Nazi war criminals such as Mengele. In addition, Kammler was not a physicist or rocket engineer. He was primarily an administrator and as such would have few skills of value to the Americans. There is a trail of evidence that indicates in the closing days of the Reich that Kammler used a long-range multi-engined aircraft to ship a large body of research material and prototypes out of the Reich. The book documents much of this evidence. References to Kammler in the official literature relating to the Nuremberg trials have been deleted. In fact, despite the knowledge that Kammler was, in many ways, number three in the Nazi hierarchy in 1945, his name only comes up once, in an indirect reference by Dornberger, during the war crimes trials, including the trial of his subordinates in December 1957 in Arnsberg, Westphalia.